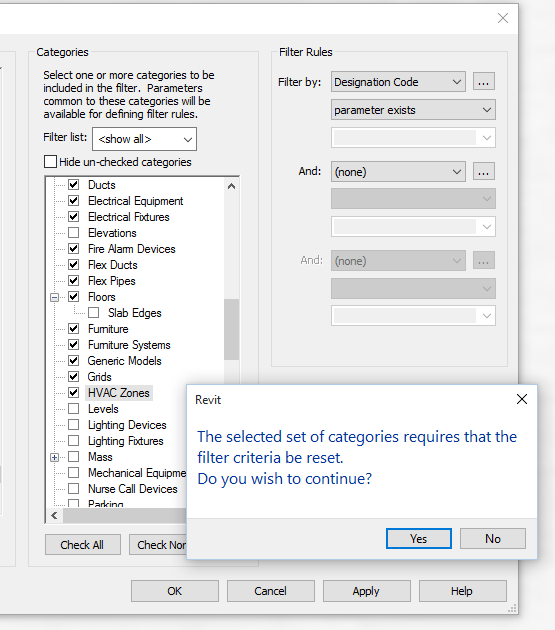 When setting up View Filters in Revit, you can only select Filter parameters that are ‘common‘ among the Categories that you have ticked… If I haven’t lost you yet, here is a quick way to build a View Filter that uses a custom parameter (like a Shared Parameter) and works across all possible Categories. @djnelson75 @lukeyjohnson that’s mysterious, especially since there’s nothing for signage and roads STILL doesn’t have a use. You can’t Schedule or Tag them normally, but you can use Material Tags, modify the Category and Subcategories using Object Styles, and view them in the Project Browser. You can change the Category of a family (using Edit Family, Load into Project) with a particular name, and all instances of that family will also (obviously) change Category. 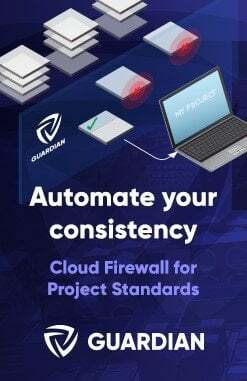 Obviously, there are certain restrictions to this process (for instance, you can’t switch to Mass category or from Mass category without some kind of hack). You can swap a family of a certain Category for a totally different family of the same Category using ‘Reload’ in the Project Browser, or ‘Select All Instances’ and then just changing the instances in the Type Selector. 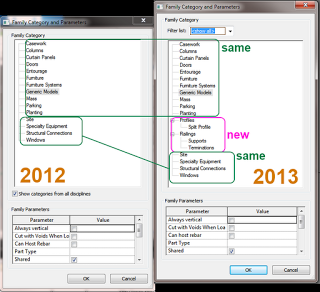 Unless you can reverse engineer this bug, you will have to essentially follow RevitCat’s advice – to change just a single Type of a Family to a different Category, I would probably Edit the Family (from the Project Browser), save/rename it, load it, Select All Instances of the Type you want to switch, change it to the renamed version, and then use the method from the first bullet point above. 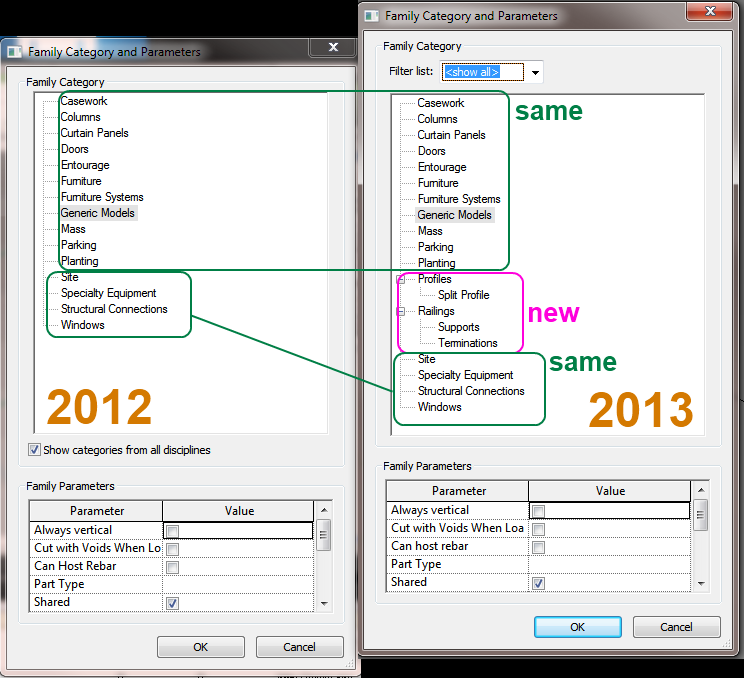 If you plan to change categories of a family, it will appear to wipe out the sub-categories – but actually they are still there, hidden away; they may show up in the project listed under the old category in Visibility Graphics. Free utility that will sort all of your families by Category! From time to time, I export all of the families in a project and add it to our Library as a ‘snapshot’ of where our families were at during that project. 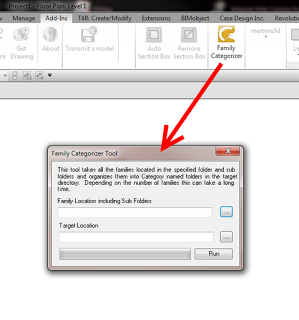 However, Revit still does not export the families into folders by Category (there used to be an add-in that did this). Happily, a new free tool from Kiwi Codes will take a folder and then sort all of the RFAs into folders by Category for you! Download (need to submit email as per image below). This tool takes all the families located in the specified folder and sub folders and organizes them into Category named folders in the target directory. 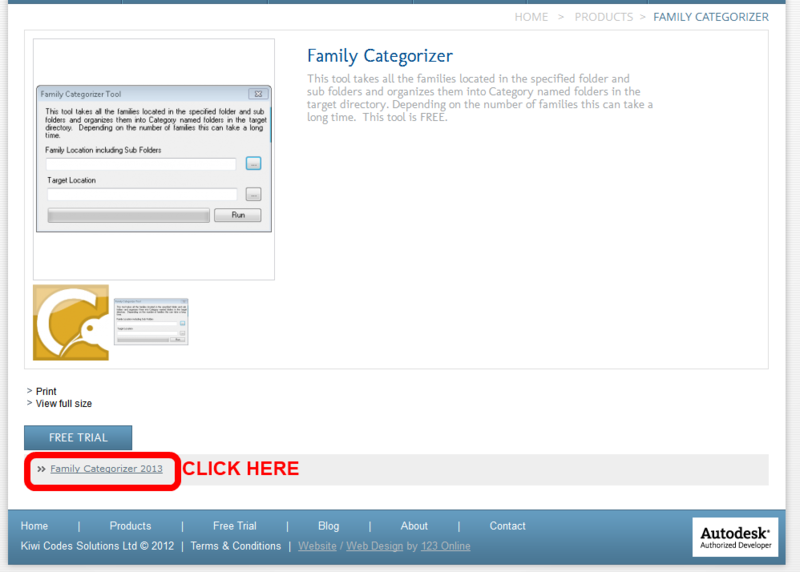 Thank you for your interest in Family Categorizer and downloading the 21 day trial. We hope that you see the benefits that Family Categorizer will bring to your business like others worldwide are reporting. 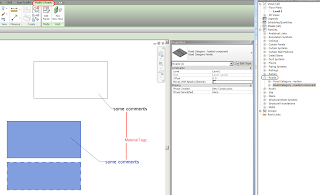 In Revit, some families have Cut Dominance, some are Cuttable, and some respect various View Range rules in various ways. 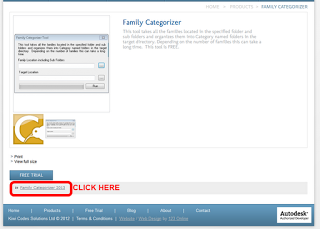 These behaviours may further be affected by the Family Template that they were created from, whether they are Hosted or non-Hosted, whether they are Shared or not Shared. Wouldn’t it be awesome if there was a document that went through each Family Category and described its unique properties! I have asked Autodesk for this before, but to no avail (SR# 1-9298685321 – The help file does not describe the unique properties of each Category). … I wish I know where to find a clear explanation of all these rules. Shades of Grey: CUT ! CUT ! CUT ! What about the Families Guide? 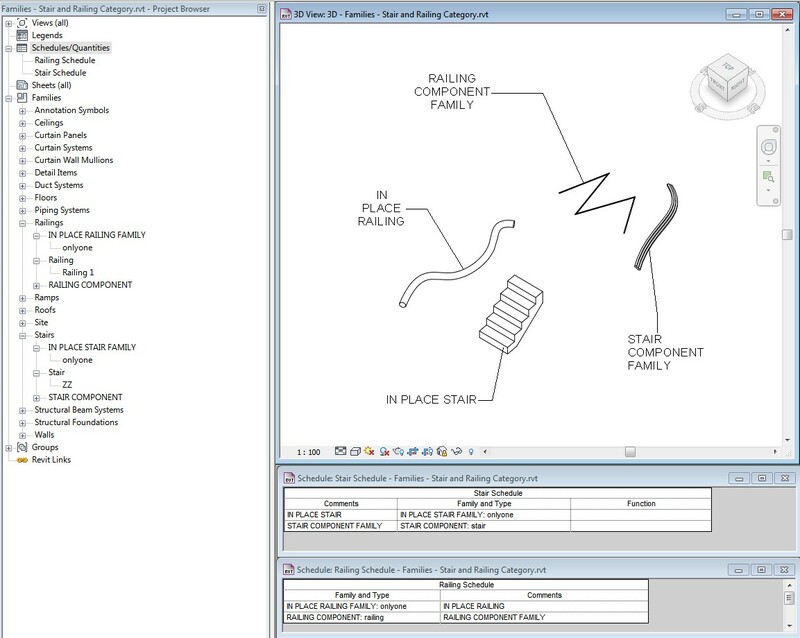 There are a few categories for which an element located above the cut plane but partially below the top clip is shown in plan. These categories include windows, casework, and generic model. These objects are shown as viewed from above. which Categories do not have Types, or which Category has Types but no Instances? I spotted this cool graphic a while ago on Revitez, but it was in French. Ben Malone has gone to the trouble of translating it into English for us – thanks mate! 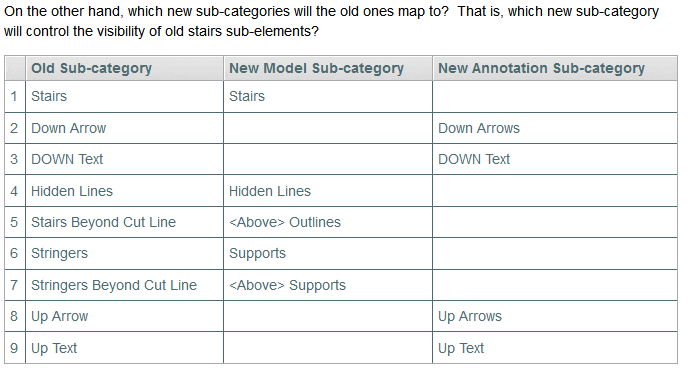 So the new Categories that support Adaptive Components are related to either Profiles or Railings. 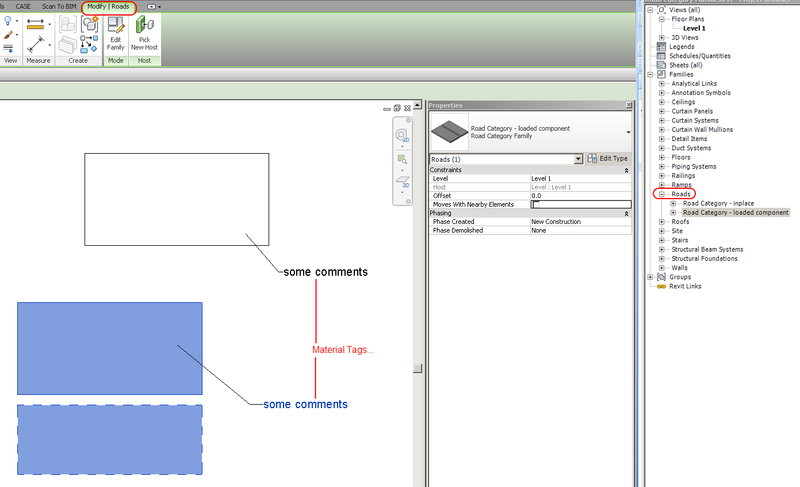 Awesome post to Wikihelp by Ping Jiang, Software Quality Assurance Engineer, Autodesk. 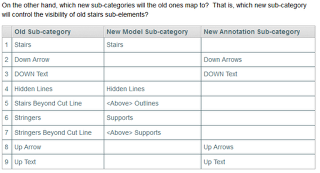 basically when the old stairs upgrade to Revit 2013 and mix with new stairs in the project, we just need to simply uncheck the visibility of ‘above’Riser Lines and Riser Lines, then the representation for them will be almost exactly the same [as pre-2013] in all the views. Here is a little gift to all my readers. 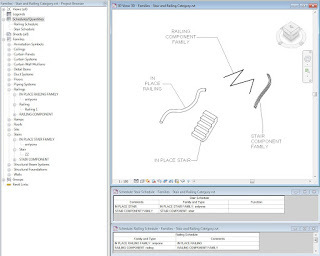 The link below allows you to download a 2012 version RVT project that contains In-place and Component versions of families that are of the Category ‘Stairs’ and ‘Railings’. 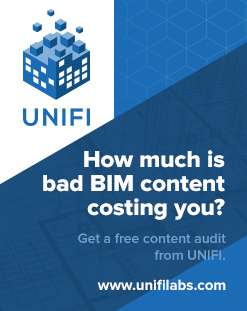 Revit does not allow this to happen out-of-the-box, so you can be sure that this hack is not best practice, and it won’t be supported by Autodesk. Use at your own risk! Having said that, if you know what you are doing, these families could be quite useful to you.